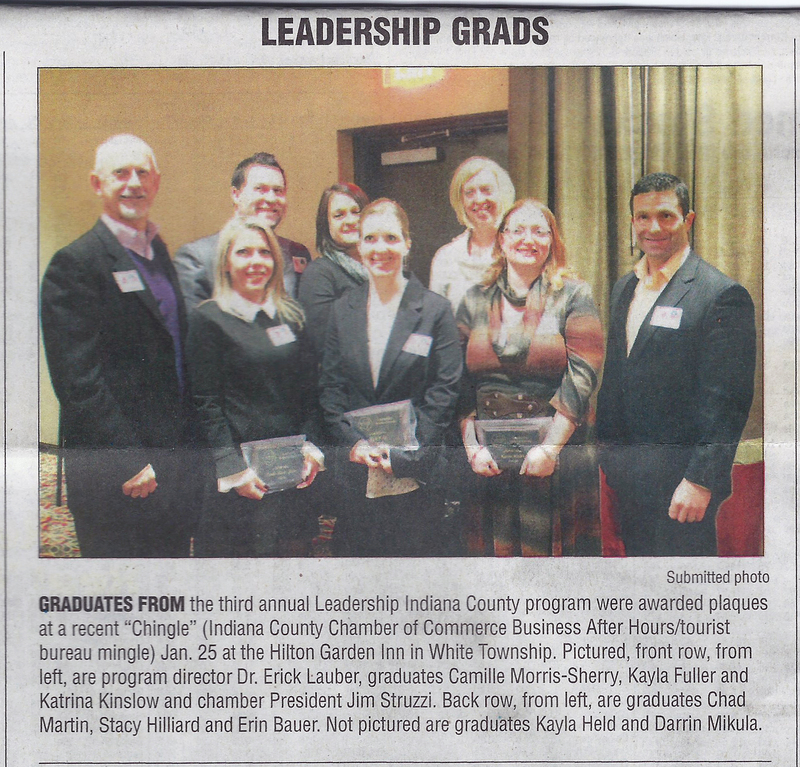 Leadership Indiana County | Leadership Realized! At present, similar programs are being conducted in Cambria-Johnstown, Clearfield, Butler, Bedford, Huntingdon, Somerset and Blair counties, not to mention the extensive Leadership Pittsburgh program conducted in Allegheny County. Graduates from the 2017 class. Graduates from the Spring 2015 class. Missing are Dana Monroe and Kristin Rombaugh. 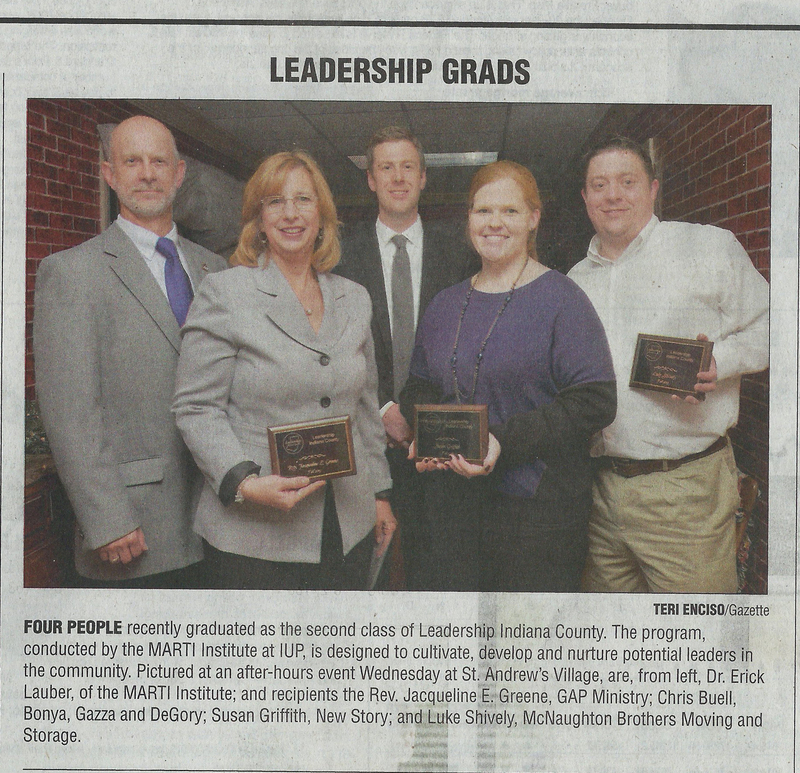 The Leadership Indiana County program is being offered by Dr. Erick Lauber, Director of Leadership Training and Research at the MARTI institute at IUP. The curriculum is being provided by Life Framing International, an edutainment media and software publishing company. 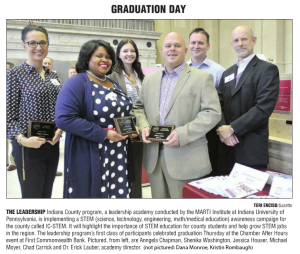 The program consists of 13 two-hour sessions conducted over the lunch hour plus a graduation ceremony. It contains a three-part curriculum: skill development and “learn about our region” curricula and a community service project. The Fall 2019 program is filling up now. Lunch will be provided for all participants. The classes are scheduled for Tuesdays from Sept 2nd – Dec. 3rd (skipping Nov. 26th.) Every effort will be made to meet on these days unless scheduling special speakers/events is required. Currently, the classes are scheduled to meet in the Small Business Incubator conference room at the IUP Robertshaw Bldg. Parking is free and right next to the building for students of the class. To learn more about the program, feel free to print the LIC Application 2019 or contact Dr. Erick Lauber at elauber@iup.edu. Feel free to visit this page to see the application. 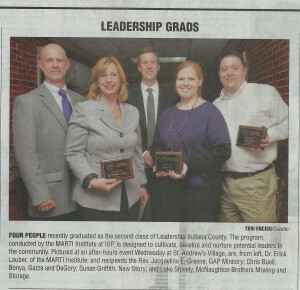 Leadership Indiana County · Leadership Realized!